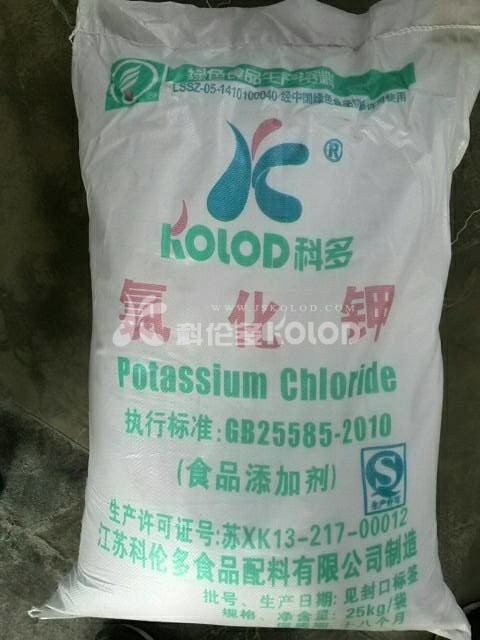 Analysis of raw materials for production of potassium chloride in food grade | Jiangsu Kolod Food Ingredients Co.,Ltd. Now in circulation industrial grade potassium chloride, roughly divided into 3 categories, the first category such as Jordan, Israel, Russia imported industrial grade potassium chloride, and potassium in the quality of the best, fewer impurities, high content (all above 95%), high whiteness is one of the preferred raw material for the production of food grade potassium chloride the. Second: Qinghai Qinghai potassium, potassium is produced by the Qinghai Saline Lake group, now owned by Chinese, middle peasants group sales in Qinghai, potassium content and the import price is moderate, but the basic content of potassium, sulfur dioxide and other impurities is higher than that of imported K, we mentioned above that the production method of food grade potassium chloride is simple physical purification method, no chemical reaction, so there is a considerable part of the impurities can not be removed in the production process of food grade potassium chloride, with production in the practical application we conclude that Qinghai is not suitable for food grade potassium potassium chloride on the contrary, it is very suitable for application, some industrial products and agricultural products. Third types: sea sea potassium potassium, potassium chloride is extracted from seawater, is now applied to many manufacturers of food grade potassium chloride production, and put forward the pure natural, no impurities content from our slogan, sea K, impurity analysis, potassium chloride seawater is not suitable for food potassium chloride production that is to be in. Food grade potassium chloride is a very popular product, the production process is relatively simple, is taken by the method of simple physical purification, is simple to potassium chloride by purification of food grade potassium chloride, so the quality of raw materials, is directly related to the quality of the food grade potassium chloride.